Glacial Lake Missoula and the Great Floods, Lex Blood, D.Sc. Figure 2.3: Lex Blood on field trip. Geologists and astronomers calculate the earth has been in existence for about 4.6 billion years. Throughout the immense span of geologic time, global plates and continents move, mountains are built and torn down, and plant and animal life-forms evolve. The primary concept underlying modern geology comes from the theory of plate tectonics. This theory holds that the earth’s entire surface crust—to a depth of as much as 100 miles (161 km)—consists of about 20 slowly moving plates fitting together like the cracked shell of an egg. These plates ride on the semi-solid, slowly flowing material of the earth’s mantle. The gradual, but cumulatively dramatic, movement of these plates and their embedded continents accounts for the volcanic activity, earthquakes, and massive uplifts that have formed the world’s major mountain ranges. Along these convergent plate margins are found the earth’s major mountain ranges—such as the Alps, Andes, and Himalayas—composed of uplifted, folded, and faulted sedimentary and metamorphic rocks, with associated volcanoes and granitic intrusions. In general, when two plates converge, the heavier (usually the material forming the crust of the ocean floor), will sink beneath the lighter, more buoyant continental crust. This process of subduction is primarily responsible for the formation of the mountainous landscape of northwestern Montana, which is only a small part of an extensive area of mountainous topography—including plateaus and basins extending from Alaska to Mexico—often referred to as the Western Cordillera or North American Overthrust Belt. The geologic history of northwestern Montana, as read in its ancient rocks, began in the Precambrian Era, which began about 4,600 million years ago and extended to about 600 million years ago. This era comprises about 80% of the earth’s history. Evidence indicates that the earth’s atmosphere during the early portion of this period—the Archean—was poor in oxygen and contained large quantities of carbon dioxide. It may have been similar to the atmosphere of Venus today, except for the presence of water on the earth’s surface and water vapor in the atmosphere. No plant or animal life existed in that early hostile world. Rain fell on a bare land surface, with no plant life to shield the exposed rock and soil. 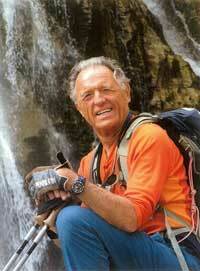 There are no exposed rocks in northwestern Montana from this early portion of the Precambrian Era. In the later portion of the Precambrian Era—the Proterozoic—weathered rock was eroded from the continents, and thick layers of sediment were deposited in a shallow sea occupying those areas known today as eastern Washington, northern Idaho, western Montana, and possibly the then-connected continents of eastern Siberia and western Australia. The environment remained remarkably stable for about 600 million years, from approximately 1,400 to 800 million years ago. Alternating layers of sand, silt, clay, and chemically formed limestone were deposited. Each layer represented changes in the source rock, type, and rate of erosion, as well as the depth and size of the shallow sea over the extended period of time. As each new layer was deposited, the older segments became buried deeper and deeper. Eventually, the tremendous pressure of the overlying layers and mineral matter deposited from entrapped seawater transformed the sediments into a 40,000- to 50,000-foot (12,000- to 15,000-meter) thick sequence of rocks now known as the Belt Supergroup, named from exposures near Belt, Montana, in the area near Helena. Exposures of these sedimentary rocks are found today over much of western Montana and northern Idaho and are the foundation, or bedrock, of much of the mountainous topography of the Flathead Watershed. This massive unit of fine-grained, multi-colored sandstones, mudstones, limestones, and dolomites provides an extraordinary record of earth’s history. Ripple marks, mud cracks, and salt crystal casts, seen abundantly in the red and green rock layers of Waterton and Glacier National Parks and the Whitefish, Swan, and Mission ranges, are similar to modern features found on the broad, tidal mudflats and shallow coastal waters of the present-day Gulf of Mexico and large inland saltwater bodies such as the Caspian Sea. 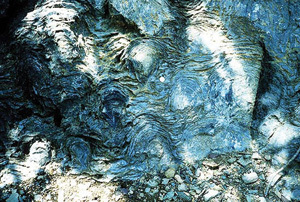 Although the Belt Supergroup contains no evidence of animal life, several formations contain fossil algae called stromatolites (Figure 2.4), found most abundantly in the gray Siyeh limestone of Waterton and Glacier National Parks and the Flathead Range. These are best seen at a road cut just east of the town of Hungry Horse along Highway 2. Geologists now believe that the earliest single and simple multi-cellular life appeared more than 3 billion years ago, beginning the emergence of photosynthesizing plants that converted the atmosphere from one rich in CO2 to today’s 20% oxygen content. The color and composition of the Belt Supergroup rocks provide further evidence of the environment of deposition. Rocks composed of fine particles, such as mudstones or sandstones with red coloration, indicate a shallow-water, oxygen-rich environment, resulting in the formation of the iron-rich mineral hematite. These brilliant red rocks—referred to as the Grinnell, Snowslip, and Shephard formations—are common in Waterton and Glacier National Parks and the Whitefish, Swan, and Flathead ranges and are well exposed in road cuts along Highway 2 near Essex. Dark green or gray rock layers indicate deeper water conditions that were poor in oxygen. These can likewise be seen along Highway 2 along the Middle Fork of the Flathead River. During the Paleozoic Era—about 600 million to 225 million years ago—sediments continued to accumulate in a marine, shelf-type environment similar to the southeastern coast of the United States and the Caribbean area today. Rocks deposited in the Paleozoic are present in the north portion of the Whitefish Range west of Waterton and Glacier National Parks. They are most easily seen in the Trail Creek drainage and in the Bob Marshall Wilderness Area, where they form the dramatic ridges, or reefs, of the Rocky Mountain Front, most notably the Chinese Wall, deep within the Wilderness Area. While the Paleozoic Era is notable primarily for the development of a wide variety of sea life, such as hard-shelled and soft-bodied animals and vertebrate fishes, by the mid-Paleozoic—about 350 million years ago—plant and animal life also began to colonize the land surface. The Mesozoic Era, extending from about 225 to 65 million years ago, is possibly best known for the extravagant development of the Giant Lizards (dinosaurs) that ruled the earth’s animal kingdom for over 100 million years, but became extinct at the close of the Cretaceous period. This extinction is believed to have been due to a large asteroid impacting the earth in the region of the Yucatan Peninsula of Mexico. While numerous species of dinosaur fossils are found in the younger Mesozoic rocks of the plains east of the Rocky Mountain Front—most famously at Egg Mountain west of Choteau—the older rocks of the mountains just to the west contain only the previously mentioned algal stromatolites and oceanic fossils such as corals and clam-like mollusks. The mountainous landscape we see in the Flathead Watershed today began to take form in the middle part of the Mesozoic Era, about 100 to 125 million years ago. Early in the era, events several thousands of miles to the east began to radically alter the peaceful geologic conditions which had existed for almost a billion years on the western margin of the continent. “Rocks are records of events that took place at the time they formed. They are books. The super continent Pangea (meaning “all land”), composed primarily of what today are North and South America, Europe, and Africa, began to break apart, or rift, along a feature now known as the Mid-Atlantic Rift, to start the formation of the Atlantic Ocean. The North American continent, riding the plate of the same name, began to move in a westerly direction, while Europe and Africa drifted easterly. As the North American continent moved westerly, the Pacific oceanic plate slid not-so-gracefully beneath it (a process referred to as subduction), rumpling and uplifting the continental edge from Alaska to Mexico. During this period of uplift, mountain building, and volcanic activity, rock material eroded from the uplifted mountains was deposited to the east on the coastal plain and in shallow waters that covered much of today’s Great Plains region, in an area referred to as the Cretaceous Seaway. The sediments were then formed into the next generation of sedimentary rocks, consisting of mudstone (composed of fine clay and silt-size particles) interbedded with more resistant sandstone and, most notably, the vast coal deposits of eastern Montana and Wyoming. While only scattered exposures of these younger Mesozoic rocks exist in most of the Flathead Watershed today, they do outcrop in the Canadian portion of the North Fork of the Flathead River and also underlie most of the area east of Waterton-Glacier National Park and the Rocky Mountain Front. Where the younger, softer Mesozoic fossil-bearing rocks can be observed along the eastern edge of the mountains from Alberta south, they lie beneath the much older Precambrian and Paleozoic rocks. Normally, the oldest formation in a stack of rocks is at the bottom, the youngest on top. The age reversal of older rocks over younger is an unusual geologic arrangement, indicating the presence of the major fault of the region, the Lewis Overthrust Fault. Geologists conclude that as the mountains rose, huge slabs of rock, some as large as Glacier National Park and up to 10 miles (16 km) thick, slowly slid eastward from 20 to 60 miles (32 to 97 km) over a period of 10 to 20 million years, riding over the younger Mesozoic rocks and producing the age reversal we note today. First observed and interpreted nearly 90 years ago, the Lewis Overthrust Fault is prominently visible north of U.S. Highway 2 at Marias Pass, along the Continental Divide. The fault is recognized as a thin bed of lighter-colored rock, about two-thirds of the way up the mountainside, separating older Precambrian Belt rocks above from younger Paleozoic and Mesozoic rock formations below. The fault can be followed north from Marias Pass to Canada and generally marks the base of the rugged mountain front—“where the mountains meet the plains.” It is inferred to be several thousand feet below the surface to the west, underlying the Flathead Valley and watershed. The Cenozoic Era, beginning about 65 million years ago, marks the transition to the modern landscape and life-forms familiar to us today. The present outline and location of the earth’s plates and continents gradually developed, and mammals became the dominant large animal group. 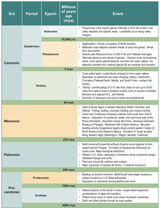 Early in this era, the intense mountain building activity characteristic of the Mesozoic Era declined, along with the associated volcanic activity. The previously uplifted Rockies were now being worn down to a gently rolling surface several thousand feet in elevation. The rock byproducts of that downcutting were spread for hundreds of miles over the area east of the present-day mountains, the parent materials of much of the rich soils of the Great Plains. 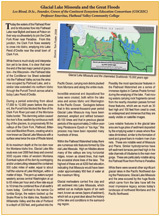 There was one more significant period in the major structural development of the modern Flathead Watershed area. About 40 million years ago, as subduction ended along much of the western continental margin, the compressional forces that squeezed and uplifted the northern Rockies and caused the formation of the Lewis Overthrust Belt ceased throughout most of the western U.S. As tensional forces associated with broad regional uplift of the western U.S. began to slowly pull the overlying crust apart, the crust thinned, stretched, and broke along nearly parallel, northwest to southeast trending faults. These actions produced downdropping of elongate valley blocks, or “slivers,” of the crust to form the so-called Basin and Range topography of Nevada and Utah, as well as the major elongate valleys of western Montana and southeastern British Columbia. 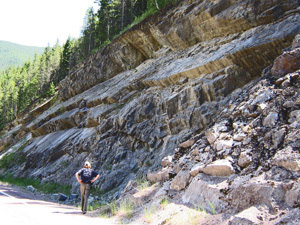 The near-vertical faults along which this rock downdropping took place lie along the eastern margins of the major valleys, such as the Flathead, Swan, and North, Middle, and South Fork. By the end of the Tertiary Period, approximately 3 million years ago, the Flathead and Mission valleys were surrounded by significant mountain ranges, such as the Swan, Flathead, Mission, Salish, Whitefish and Livingston ranges. These mountains had been formed by major crustal movements over an approximately 100 million year period, but were shaped and modified by stream and river erosion. This was the setting for the next, and very dramatic, step in the evolution of northwest Montana—glaciation. It is a common misconception that glaciers created the mountains that are such a significant part of the Flathead Watershed landscape today. By the time glaciers began to form 2 to 3 million years ago, ushering in the Pleistocene Epoch, mountains already surrounded the Flathead Valley, the product of 100 to 150 million years of geologic activity. Glacial ice only sculpted the mountainous landscapes to fashion the spectacular craggy peaks, knife-edge ridges, and deep, U-shaped valleys evident today. While comprising a relatively short period in the geologic history of the watershed, glacial carving of the bedrock and deposition of the resulting rock sediment into the adjacent valleys have been particularly influential in creating today’s surface features of mountains, streams, rivers, lakes, and rolling valley floors which form the ecological basis for the native plants and wildlife of the region, as well as human habitation and resource development. During the Ice Age, or Pleistocene Epoch—extending from approximately 3 million to 10,000 years ago, massive glaciers, referred to as the Flathead Lobe of the Canadian Cordilleran ice sheet, advanced at least four times from Canada south into the Flathead Valley, extending as far south as St. Ignatius. This long valley, which extends some 600 miles (966 km) from St. Ignatius north into British Columbia, is referred to as the Rocky Mountain Trench. Smaller alpine glaciers flowing from the higher mountainous regions to the east and west of the Trench joined this huge tongue of ice, which advanced and retreated dependent upon climatic conditions. In the Flathead region, the ice, from valley bottom to ice surface, was over 4,000 feet thick at its maximum and covered all of the Salish Range on the west side of the valley, all but the highest peaks in Glacier National Park, and most of the Whitefish, Swan, and northern Mission mountains. Similar outlet glaciers flowed east onto the plains and joined the huge continental ice sheet flowing south from its origins in Canada. Glaciation is a powerful and rapid tool for reshaping the landscape. Like the slower wind or water processes, glaciers not only downcut the bedrock, but also transport and deposit the resulting loose rock materials to lower elevations. The craggy, rugged topography in the mountains of the Flathead region is a result of the abrasive scouring action of glacial ice, which created the classic deep, straight, U-shaped valleys and knife-like ridges (arêtes), three-sided peaks (horns), and hanging valleys typical of alpine glaciated regions. This type of topography is most typical of the higher mountains east of the Flathead and Mission valleys and particularly Glacier National Park. As a result of this glacial action, the valley floors are covered by rock materials (glacial till) transported and deposited by glacial ice, glacial meltwaters (outwash), or by the cold winds that blow off the glaciers. Each type of material has characteristics of grain size, rounding, and sorting, which make it possible to identify the means of transport and deposition and determine the capacity of each as habitat for plants and animals and usefulness for human activity. Where ice flowed over the tops of the mountains, it scoured the rock surfaces, rounding the mountaintops and lowering their elevations. The Salish Range and the northern end of the Mission Range along Flathead Lake show the results of glacial overriding. Smoothing and grooving of rock surfaces on some of the lower, more rounded mountains and hills is still noticeable. A particularly good exposure can be seen along the south side of Highway 2 at Mile Marker 107 west of Kila. The forces of wind, water, and ice continue to change the face of the land. The constant stress of freezing and thawing causes rock faces to slowly break apart and produces the commonly found talus (scree) slopes. Streams and rivers seasonally move these rock fragments from the higher mountainous regions to the valley floor and lake bottoms below. These fragments then become the parent soils for various types of vegetation and habitat for the diverse wildlife of the watershed. The Flathead Watershed remains a dynamic environment as this action of wind, water, and ice continue changing and shaping the landscape today.